There are numerous posts about clutch drag but most are scattered within other threads so lets centralize this and maybe help me help you fix yours as I am in the middle of numerous right side upgrades (water pump, oil pump gears, etc) and now have the parts and tools to try some things. So I put all new plates in mine, steels and frictions, from Beta, also had a new basket but it turns out it was the wrong one, so I put my old one back in, and the drag is worse, but haven't rode it, just idling in garage so I don't chalk it up yet to not fixed, but certainly not better. Remove concave washer- I see this is most likely fix and will try it but assume you need to remove the thin fiber plate, concave washer, and flat washer, and replace with a normal fiber?? Anyone? Center hub over torqued- I torqued mine to 50 ft/lbs (67 nm) and notice zero change. Other input or ideas for me to add? My bike is 15' 350RR Race FYI. I have done all that and more. No big changes. 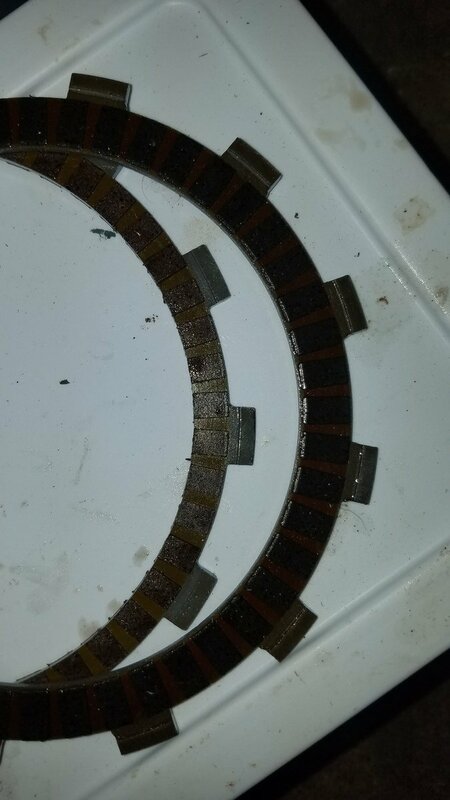 My clutch stops dragging by about 50% once the motor is very hot. I no longer am chasing the issue. If I didn't want to change oil pump gears I would be living with it too...but since I am there...wanted to look..etc. This one of the issues I keep reading about that we just don't get. Having gone through several Beta's both 2t and 4t we have zero clutch issues. Maybe they are a little draggy when the bike is brand new, but after one ride it's fine. I used to take out the inner spring plate thing, but now I don't even bother. Maybe it's because the bikes get ridden hard? He also does a lot of trials stuff using the clutch and they don't drag for this kind of work ether. Standing behind a starting gate I notice a lot of bikes clutches starting to creep when the gate is held too long, but his Beta doesn't creep at all. There are issues we have that I never seen brought up here and others like this that we never have. Goes to show how different peoples experiences can be. I would recommend trying a longer push rod? Have you checked the ends of it to make sure there is no wear? perhaps a ball bearing inserted would do it? I am sure this is directly related to the hard to find neutral. This one of the issues I keep reading about that we just don't get. Having gone through several Beta 's both 2t and 4t we have zero clutch issues. Maybe they are a little draggy when the bike is brand new, but after one ride it's fine. I used to take out the inner spring plate thing, but now I don't even bother. I was hoping you guys would chime in....was hoping you had some super trick to do. When you took the one unique inner fiber out and washer, did you put a regular fiber in its place? Possible idea but I dont think wear is an issue since mine has been realtively the same drag since day one...not worse or better now. + Me too. I only experienced clutch drag the first few hours. I left the Judder spring in as well. Sorry no good tricks. Yes standard fiber plate put in it's place. We always changed it just because it was the thing to do, but last year Ty started riding his 250 before we had a chance to change it out. Later I was going to do it, but he was like "why? Clutch feels good the way it is" now a couple bikes later we haven't bothered. I think somebody posted about putting the bike up against a wall and revving the bike while slipping the clutch to get it broken in. Something like that might help things get loosened up. Beta told me via email to do that early on and I never did. Something I didn't like about the process but thats just me. What is the judder spring in there for anyway? Working for a car/truck company, folks typically don't put parts/cost into a unit unless it has a useful purpose. Keep the plates from rattling around? Always a slight tension/preload on the transmission? Just curious. Now that I know that clutch cover O-ring is good for multiple R&R I am open to try a few things. Interflon FIN 25 and drag was gone on my 498! Will report back how it holds though! Special single inner fiber shown with judder spring and washer. Installed one of my used dull size fibers in place of special one and judder and garage test says its MUCH better. Proof once I ride it but work calls. Better pic of the two fibers next to each other without the judder spring and washer inside. I am planning to look into the Barnett Kevlar fiber plates. The drag in mine gets worse as it heats up. Sometimes I can feel the drag on the overrun when I pull in the clutch, it surprises me. I will talk to Barnett next week. They are just around the corner from where I work. I see the plates listed on their website. After tearing into mine, I think we are over thinking this. The judder spring has got to be the issue. Those that have no creep/drag have a weak judder spring, in my opinion. Hit Barnett up for a billet basket...I emailed them and got a "uh no...and no" answer. I stopped in at Barnett today and talked with their head tech guy. He also said the "judder plates" are most likely the problem. It has been a problem in some other bikes also. I showed him the parts diagram and he said to remove all three plates (#19 & 35). I asked about their Kevlar friction plates and he didn't think they would make a big difference in terms of drag. I asked him about running ATF fluid and he thought it would most likely improve things. I asked about Dexron vs type F. His answer was it depends on how you like the clutch to engage. The Dexron gives a softer engagement, quite similar to regular motorcycle transmission oil while the type F will give a harder, more aggressive, engagement. Otherwise they are quite similar. He did say the viscosity is lighter than 10w-40 gear oil so you may hear a tiny bit more noise from the trans. So my plan is to remove all three judder plates and try Dexron ATF fluid and see how that goes. BTW, I was able to get a tour of the factory. They make almost everything in-house for both the clutch parts and cable assemblies. They are also making hydraulic hose assemblies now. Yes, everything you mentioned above has already been discussed in multiple threads. Report back when you remove 18/19/19/35 and add in another 17, please. Disc #18 stays, you don't remove it. You only remove (2) #19 and #35. They fit inside the center of #18 applying pressure on the first metal plate. I will try it, see how it works out, and certainly report back my results. When you remove the judder on the KTM, Honda, and other bikes, you remove the judder compatable fiber disc and replace it with a standard disc. I would imagine that to be the best practice on this mod as well.